Today, I am going to talk about shoes. They're not just shoes, they're vintage shoes. 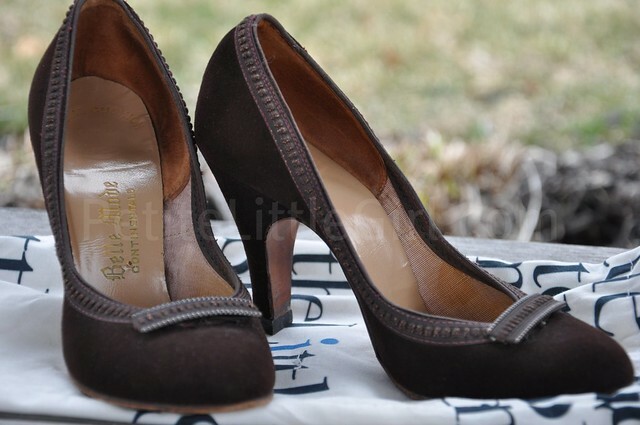 I was thrilled that TheLittleShoeStore.com (TLSS) has contacted me for a review of their vintage petite shoes. I never had any problems finding a pair of shoes that fit. However, I totally understand the frustration of women who have small feet. TLSS currently carries shoe sizes from 4 – 5 ½ in stock. Since my shoe size is out of this range, my sister will be modeling in this post. She typically wears a size 3 in girl’s shoes. Continue reading..
As a teenager and well into her 20s, the owner of TLSS wears a size 4 in shoes. She had no place to shop for shoes outside of children's departments. As a young woman who was quite fashion conscious, it was so embarrassing to be wearing little kids shoes. On very rare occasions, she would come across a size 5 that ran small and she would literally wear these shoes until they fell off her feet. She had taken to the internet, shopping various vintage stores for petite shoes, a time consuming, arduous process. It occurred to her that what was needed was an online store strictly for petite feet and there was no reason she couldn't make that happen. So was born The Little Shoe Store. Someday she hopes to add new shoes and have a boutique as well but for now, she is happy to help women with petite feet find shoes online of which they can be proud of. • Like mentioned previously, TLSS currently carries shoe sizes from 4 – 5 ½. However, the owner offers a special service. If you don’t see anything you like on the website, TLSS will be happy to track it down for you based on your choice of decade, style and of course your size. • Currently in stock are shoes from the 1930s to today. The shoes that my sister is wearing in this post were from the 1940s. They are an exquisite pair in great condition, as you can tell from the picture. The vintage details are in great shape, as well as, the suede material. • Since they’re vintage shoes, each and every pair is unique. More than likely, you’re not going to see someone who wears the same shoes like yours. • Every shoes come with its own dust bag for easy storing. • Prices are depending on the style, the age of the shoes and their uniqueness. Ranges are from $45.00 - $125.00. For reference, the shoes modeled in this post retail for $125.00 since the condition is like new. • One thing I’d like to mention is TLSS doesn’t charge for shipping. They’ll ship your shoes free of charge. • Every style has a specific measurement in inches and centimeters. The measurements are for both insole and width. Therefore, you can easily measure your foot size and select the exact fit. My sister followed this guideline and the fit is spot on. • If you are in the New York metropolitan area, you can make arrangements to try on shoes before making a purchase. Please contact TLSS to do so. • TLSS also has a flexible return policy. Please click here to see the full return policy. TLSS is truly a dream come true for women who have small feet. They are not just petite shoes - they are also vintage shoes with their own uniqueness. My sister is extremely happy to find a pair of adult shoes that fit her. For those of you who like vintage shoes and have small feet, I highly recommend TLSS. The owner of TLSS generously offers 20% discount for readers of PetiteLittleGirl.com. Please put “PETITE LG” in the instructions box when ordering (one time use) and 20% off of your entire purchase will be refunded through PayPal. I hope you’ll check them out and find yourself a pair of lovely vintage shoes. Thanks TLSS for giving us a chance to review your products. Disclosure: My sister received these shoes courtesy of TheLittleShoeStore.com. As always, my reviews are my personal opinion. She will not be compensated for posting this review on my blog. Wow, size 3? Is women size 3 the same as girl's size 3? My 11 year old daughter is wearing a girl's size 3. 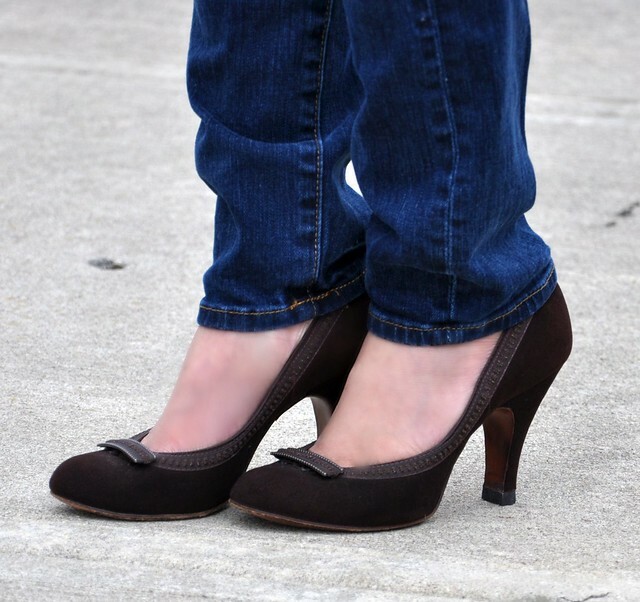 Your sister looks adorable in these pretty pumps. She looks very proportional. How tall is she? @Vicky Thanks Vicky. Jasmine would not have any problems finding shoes. I think my sister is 5 ft tall and 92 lbs. These shoes look lovely and it's so nice to see little shoes being made with special detailing and in different styles! What a great showcase for a company specializing in small feet! I have average feet, so TLSS sizing is out of my range too. Though I won't be able to take advantage, thank you for doing this review! Your sister looks great in her vintage shoes. I see a slight resemblance between you two. those shoes are super cute. glad to see another company cater to small feet. i'm a size 5.5, just barely making the cutoff...lol. thanks for introducing us to this company. i will definitely check it out. I'm so happy you posted this! I'm a size 4.5 and I totally sympathize with all the above. Thanks again for the recommendation for 6pm.com, sadly haven't found a style I like yet. Wow those shoes look tiny!!! 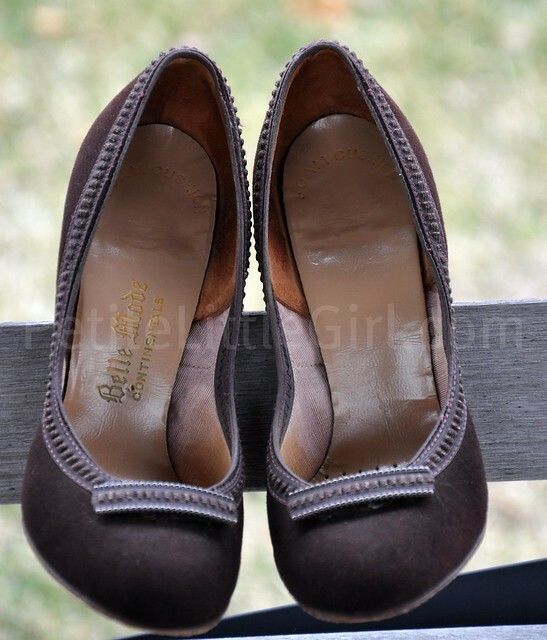 I love seeing vintage jewelry and clothing, but vintage shoes are a first! My shoe size is also out of that range, but your sister's pair is very adorable. Gah your sister is so pretty too! You must have turned a lot of heads together! This is great for women with small feet, really nice that there are more choices out there. Thanks for the awareness! Wow thanks! Another store that caters to tiny feet! I love that vintage shoes, suits your pretty little sister too! Oh what an interesting business concept! And it's nice to see your sister finally making a modeling appearance on here. What jeans is she wearing? (sorry if it's mentioned in this post, but I didn't see it). At first I thought they may be Gap, but the rise is low. They look flattering on her! these are really cute shoes and i love the unique designs. thanks for introducing us to a new petite-friendly company! Really cute shoes! I didn't know people with small feets have problems. It feels so good to find a place that carries your shoes size. Those shoes are really cute! I wish I can fit them lol. This post will be really helpful for my friend; I can't wait to show it to her. And the good thing? We live in NYC so she can easily try on the shoes first! Oooh what a great resource! I must share this will all my little footed friends haha. Do they ship free anywhere in the world or only in the states? P.S. Read the Chanel husband persuasion post below... too funny!